It was bought up and restored in 1977 and today accommodates the Marché aux Vins, its architectural beauty being equalled only by the exceptional wines presented. Noteworthy: this is where one finds the only vineyard within the historical centre of Beaune, at exactly the same spot where the Franciscans used to cultivate white vines to produce altar wine for mass. In 1789, there were only 7 monks aged more than 70 years old. According to the plan that was established by Quinard in 1791, one could discover a project of a prison in the Couvent des Cordeliers, which was luckily abandoned. In 1792 the property was sold and the project of Grain Market was first evoked. In 1803, the choir and the church entrance were destroyed to create the existing rue de l’Hôtel-Dieu. From this moment on, the place was in decline, the chapels were sealed and the buildings were constructed in the street. The Church of Cordeliers was forgotten. From 1972 to 1976, Mr. André Boisseaux proceeded with a restauration of XIIIth Chapel and construction of the cellars. As a result, Marché aux Vins was created, a real tasting temple in Beaune. In 2012, Halley family entered into an agreement with the Boisseaux family to take control of Marché aux Vins and performed the renewal work of this tourist place. In May 2014, the first stage is completed: the Chapel was opened onto rue de l’Hôtel-Dieu and Cellier des Gourmets, a special wine and gourmet shop, was created. 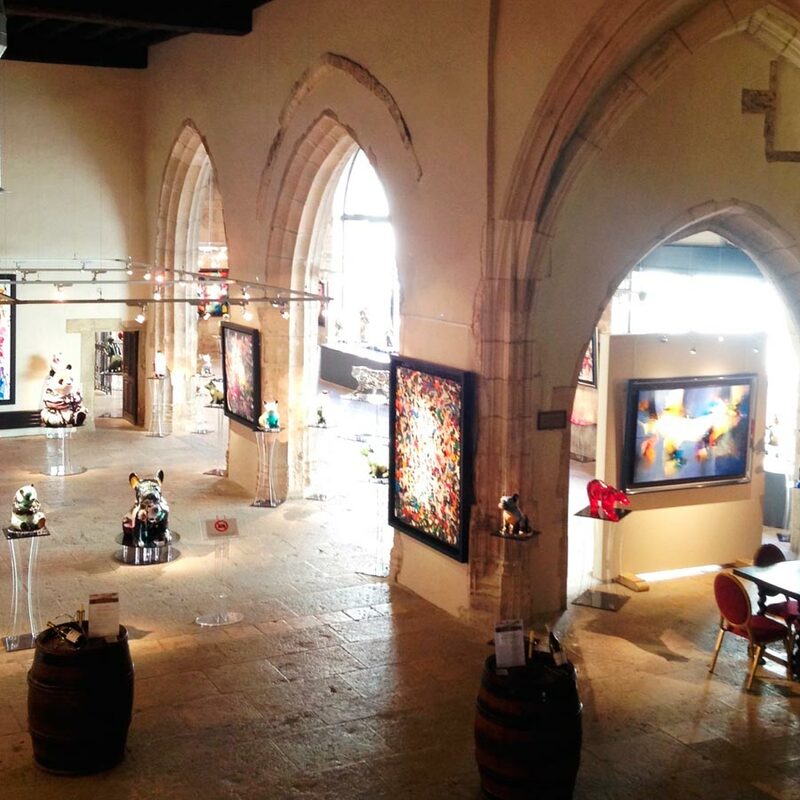 In 2015, the second stage was launched together with Bartoux Gallery, a family owned business specialized in modern art, that exposes in the Chapel of the Cordeliers Church. 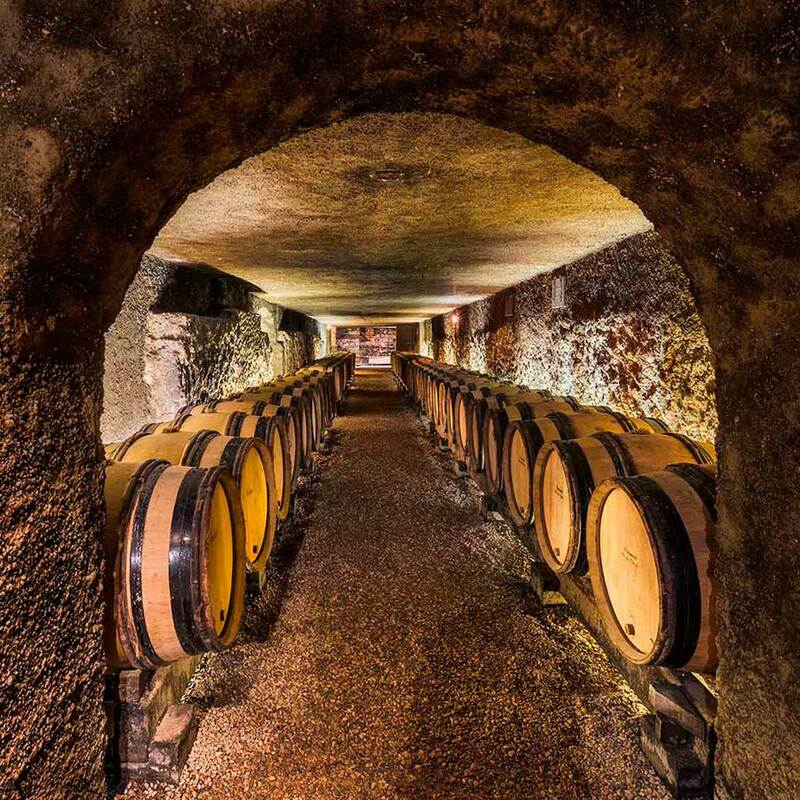 When clients come for the tasting at MAV, they discover the substructure of the ancient Cordelier Church, that was transformed into the cellars where old vintages are stocked for more than 40 years. On the 1st floor one will discover 3 Chapels that still stay intact: Saint-François, Saint-Antoine and Saint-Sébastien. These are the remnants of this church, raised in XIVth and XVth centuries. Even though we know the exact day of the construction, the 24th of March, the year still stays unknown. The majority of historians agree that it must have been built between the late 14th and the early 15th century. Several fragments of the tomb stones witness the interest of Beaune citizens in the Franciscan brothers. This tomb was a real devotion and charity sign. It was always accompanied by a donation made to the Church and the clerics were supposed to pray for the benefactor’s soul. This Franciscan church, which was dedicated to Saint Bernadin, was exceptionally high so that its bell tower competed with that of the Hôtel-Dieu. Its entrance facing the North would today be in the axis of Rue de l’Hôtel-Dieu. 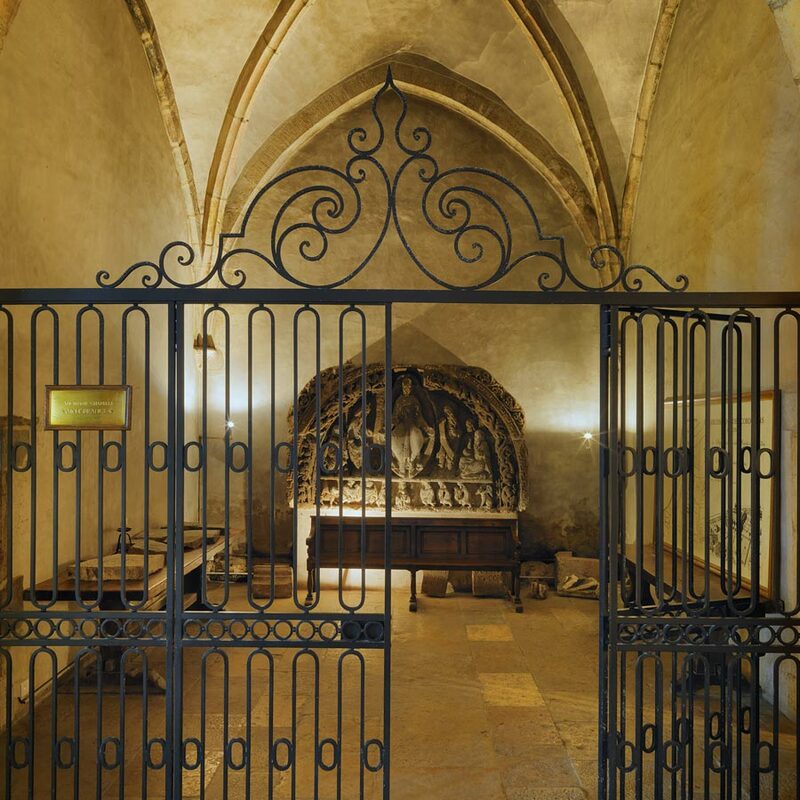 The visit starts in the cellars situated in the basement of the former Cordeliers Church. The visitors taste the first wines, i.e. the red wines, according to the Burgundy tradition. They discover old vintages (up to 1958) and the wines from Hospices de Beaune. There are information boards all over the oenotouristic path, that cover the major history questions about the place and explain the wines of Burgundy. More than 22 000 bottles are stocked in the cellars of Marché aux Vins. 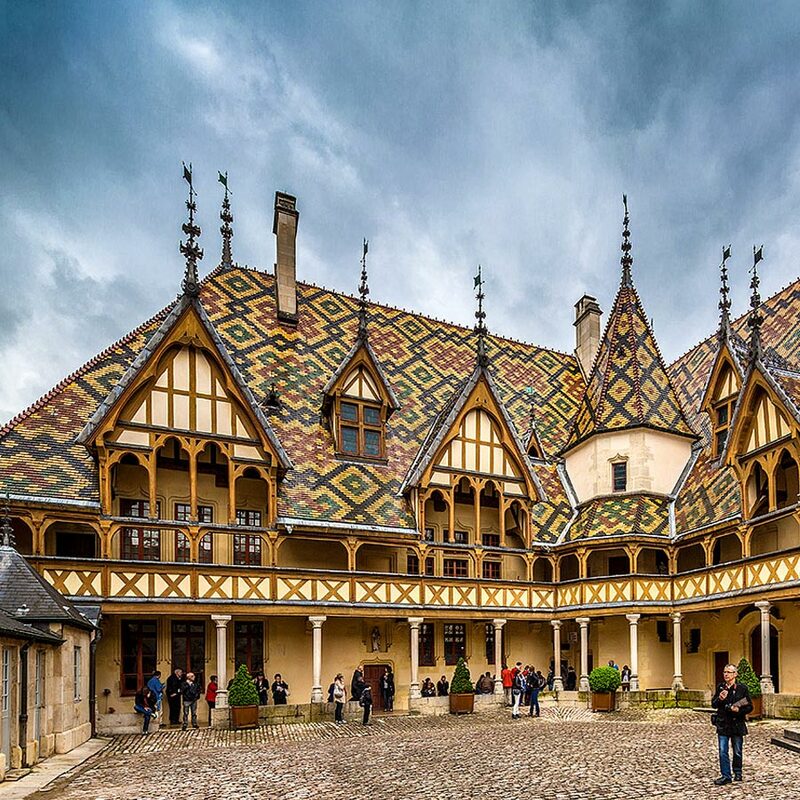 It is in the middle of XVth century that Nicolas Rolin founded the hospital, Hospices de Beaune. It was created in the Northern part of the Franciscans garden in return of a room aimed for the Cordeliers’ sufferers. At the beginning it was confirmed that in order to avoid any disturbance, no opening should be done on the façade overlooking the Cordelier church. In 1239 quite a special procession escorting the Christ’s crown of thorns made its way to Paris. As it arrived in Beaune, one of its members fell ill. His name was Valérien and he belonged to the order of Saint Francis, a very young order known in France as the Cordeliers due to the rope-like cord they wore around their waists. It was founded by Francis Bernadone, better known as Saint Francis of Assisi. Unable to continue the journey, Valérien was left behind in Beaune with another one of the friars to help him regain his health. The township granted them accommodation in the guardhouse at the Bellevent town gate, situated in what is today Rue de l’Hôtel Dieu. On the 15th of July 1246 Pope Innocent IV gave his consent for the foundation of a Franciscan convent in Beaune. At the beginning it was confirmed that in order to avoid any disturbance, no opening should be done on the façade overlooking the Cordelier church. The Cordeliers order declined in the XVIII th century and the church disappeared during the French revolution, due to the confiscations. In 1803, rue de l’Hôtel-Dieu was opened, the nave was destroyed and the Chapel was separated from the convent. This church was used as a prison, grain hall, stable, warehouse and tin workshop before being transformed into a car garage in the beginning of the XXth century. The exposition of Paul Day will start on the 13th of May 2017 in the Cordeliers Church, situated at Marché aux Vins in Beaune.The installation started with transhumance of Charolais from Abbaye de la Bussière parc to the Cordeliers Church. These 3 bronze artworks – bull, cow and calf – will soon be joined by thirty different bronze sculptures that bring together architecture and everyday life scenes.Paul Day is an English artist who has lived in Burgundy for the last 20 years. He is well known for his monumental sculptures and especially for the works of art ordered by the British Crown. These include the famous embracing couple at Saint Pancras Railway Station in London and 25-meter long The Battle of Britain that borders the river Thames. A terracotta copy of this artwork that commemorates a tragic episode of World War II is exposed at Beaune Porte Marie de Bourgogne.Together with this famous sculptor, Marché aux Vins strengthens its vocation of bringing art and pleasure of tasting together in a unique place in Burgundy. Vernissage – 13th of May 2017 from 4 pm. The visit and tasting experience start and finish in Cellier des Gourmets, a special space where one can find a fine selection of wines and gourmet products proposed by Marché aux Vins. Marché aux Vins presents beautiful range of wines from Chablis to Pouilly Fuissé, with a special attention to Côte d’Or and its wine capital – Beaune. A part of this selection, situated in the Church, is also open for the visitors. A variety of champagne and crémants de Bourgogne complete the offer for the holiday events. Because the wine is usually appreciated at the table, Marché aux Vins proposes a range of gourmet products to its visitors. Naturally, the local Burgundy products are in the center of this selection: they have been carefully chosen for their quality and ethics approach that we share with their producers.